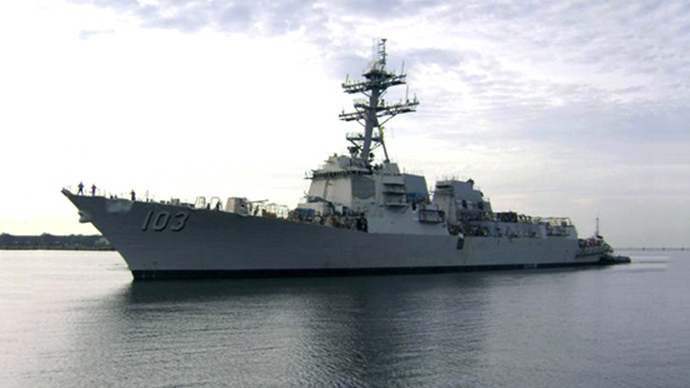 US Navy destroyer, the USS Truxtun, has crossed Turkey's Bosphorus and entered the Black Sea. With the Crimea Peninsula getting ready to hold a referendum on independence from Ukraine in a week, the US is ramping up its military presence in the region. USS Truxton is heading to “previously planned” training exercises with the Bulgarian and Romanian navies, AFP reported earlier. 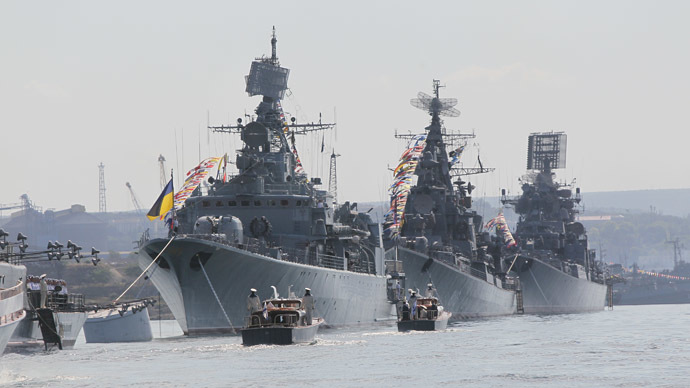 At the same time, Fox News declared that NATO’s bolstering presence in the Black Sea is a “defensive” measure to counter “Russian military aggression” in Ukraine. The situation in Ukraine is close to financial and humanitarian catastrophe, urging mass protests in eastern regional centers against self-proclaimed government in Kiev. The autonomous Crimea region is preparing to hold a March-16 referendum on whether it wants to remain part of Ukraine or join Russia, after ousted President Viktor Yanukovich fled the country and the opposition imposed a central government. 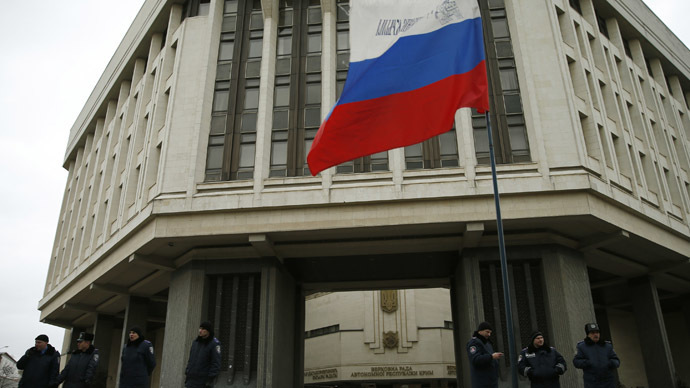 Subsequently, Russia’s upper chamber of the parliament approved the possibility of Moscow deploying troops to Ukraine and particularly to Crimea – but only to protect ethnic Russians in Crimea. On Friday night, Vladimir Putin’s Press Secretary, Dmitry Peskov, warned of possible ethnic cleansing of the Russians in Crimea if the people who seized power in Kiev also grasp autonomy. Peskov stressed that Russians in Crimea and eastern Ukraine are “scared and are asking for help from Russia”. “We fully understand thefearsthat now prevail in the East [of Ukraine],” Peskov acknowledged. However, the US State Department doesn’t see any possible danger to millions of ethnic Russians. Russians make up well over 17 percent of Ukraine’s 45 million population, whereas in Crimea Russians are over 58 percent of the autonomy’s nearly two million population. "There are no confirmed reports of threats to ethnic Russians," Eric Rubin said, testifying before the House Foreign Affairs Committee. Mr Rubin is a Deputy Assistant Secretary of State in the Bureau of European and Eurasian Affairs. USS Truxton, with a crew of about 300, is an Arleigh Burke class destroyer equipped with the Aegis combat system, which integrates the ship's radar, sensors and missile weapons to engage anti-ship missile threats. The warship is part of the USS George W. Bush Carrier Strike Group currently stationed in Greece. The carrier is not expected to move into the Black Sea in respect of the Montreux Convention of 1936, which closed Turkish Bosphorus and Dardanelles for ships with deadweight over 45,000 tons. With its 97,000 tons, the USS George W. Bush is the world’s largest warship. 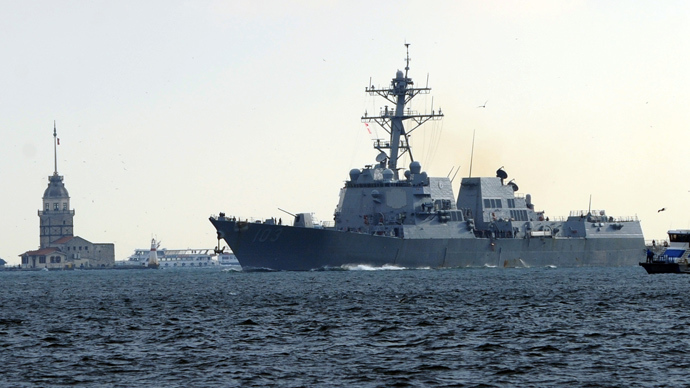 USS Truxton has taken up the baton of American military presence in the region from frigate USS Taylor, which ran aground in the Turkish port of Samsun in the Black Sea last month, with a broken propeller hub and blades. On Friday, a tugboat began to tow the damaged warship to Greece’s island of Crete, where it will be repaired at the US Navy base in Souda Bay. 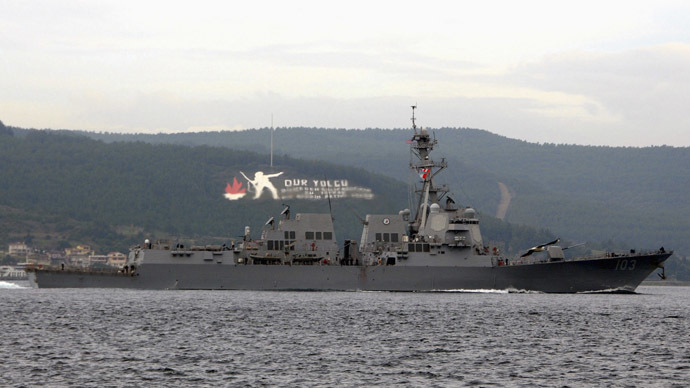 USS Truxton will reportedly stay in the Black Sea till mid-March. The Montreux Convention allows a warship of any non-Black Sea country to stay in the region for 21 day only. 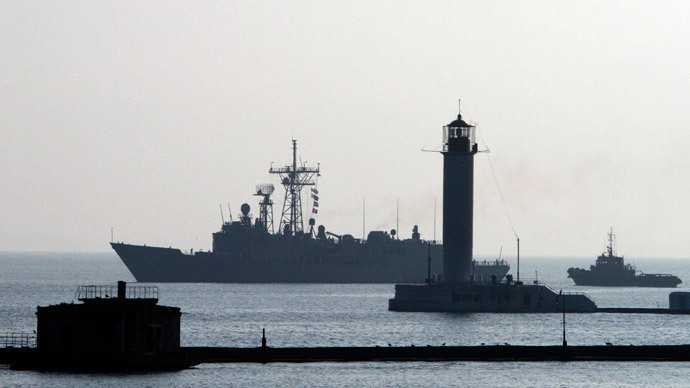 During the military conflict between Russia and Georgia in August 2008, an American ship was also present in the Black Sea with reconnaissance and an officially proclaimed humanitarian mission. In September 2008, the US costal guard ship, Dallas, docked at Sevastopol harbor with a secret mission and had to leave in haste because of mass local protest. 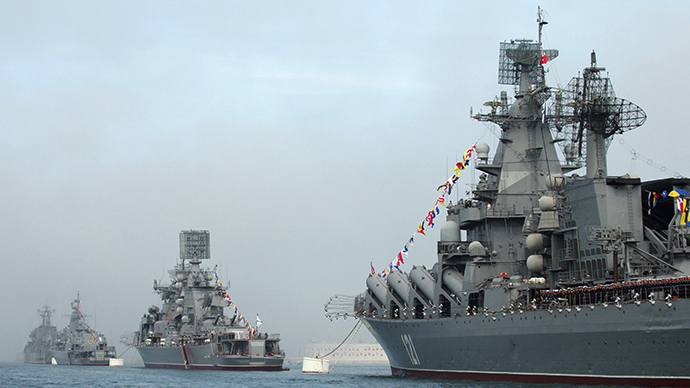 Given the present conditions, an American battleship is highly unlikely to get anywhere near the Crimea shores, let alone Sevastopol, without a risk of repeating a hasty exit from the past. On February 12, 1988, a Ticonderoga-class cruiser, the USS Yorktown, and a Spruance-class destroyer, the USS Caron, had to flee from Soviet territorial waters off the Crimean Peninsula. After the two American warships ignored the Soviet Navy’s demands to leave country’s territorial waters immediately, the Soviet frigate, Bezzavetny, simply rammed both American ships, forcing them to comply with international maritime rules.